Check out the OOT bags my sister is making for my wedding. She's doing an awesome job in my opinion. Bags = The bags were about $1 (after coupon) from Hobby Lobby. Ribbon = The ribbon was cheap cheap from JoAnn Fabrics online. It is secured with iron-on tape. I love cheater tools. The bow that is tied on the handle is detachable. Logo = I created it using Word. She used iron-on transfers to get it on the bag. MM, those are absolutely ADORABLE!! ok, where did you get the iron-on transfers? The bags and iron-on transfers were from Hobby Lobby (a craft store like Michaels here in Texas). Every week they have a 40% off coupon in their ad so we put it to good use. The bags ended up costing $1 each. My sister bought the ribbon and transfers so I don't know about that. Holy Martha Stewart those are so cute! You're funny - thanks! Actually, one of my friends alternately calls me "Martha" and "soccer mom". Adorable! Your sister is quite talented... they are very stylish. I think that route is the most economical route and still have a personalized look. April (Msmaize)also did a similar OOT bag I will definately "steal" this idea!!! It's all coming together now...getting nervous? excited? or just too busy to know? thanks! i'm lucky my sister is so into my wedding details. i remember april's stuff. she seems like she had a great wedding! her ideas definitely influenced me. Your bags are so cute. I actually have been doing the same thing with the Michael's coupon. Every week I go buy one package of bags. I might have to steal the ribbon idea....too cute! Thank you for sharing all of your ideas. 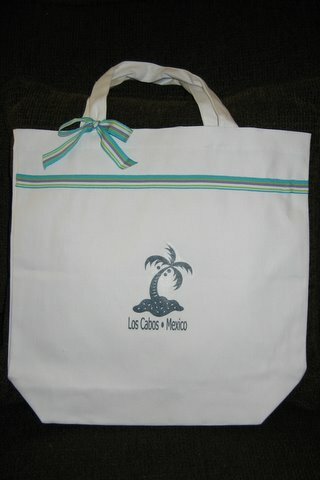 I am going to Cabo next week to meet with Emeline and all other vendors. I am so excited. Aren't coupons great? Have a wonderful and fruitful trip! I can't wait to read your review and get some good tips from you as well!